You’ll find 10,000 Birds a pleasingly merchandise-light site, at least for the time being. What we’re selling right now are memories of brilliant birds gone by. For example, during my long and tasty weekend, I spotted a variety of early winter species, the best of which was Golden-crowned Kinglet by the flockful. 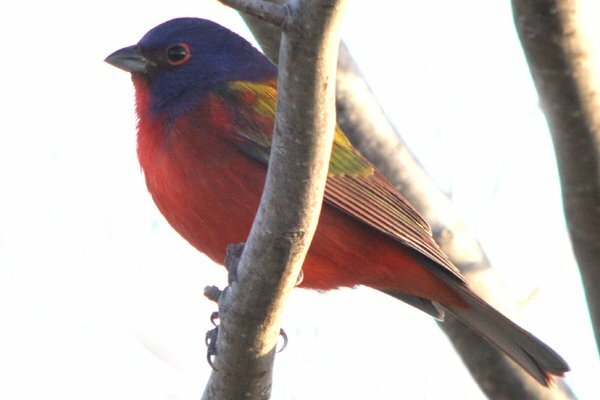 Corey’s Best Bird of the Weekend™ was, in typical hyperbolic fashion, a lovely, rare male Painted Bunting in Connecticut of all places! Does this mean I have mail in a royalty check every time I use the phrase “Best Bird of the Weekend”? On my way home from Black Friday lunch, near dusk (that’s 4:00PM in northern Michigan this time of year on a cloudy day) in a snowstorm I got to see eight ravens harassing a second-year bald eagle. A pretty common sight, but the snow and near-darkness made somewhat surreal. Kirby, you get to use the phrase royalty-free! I heard my first Bronze Shining-cuckoo of the summer on Sunday down the valley from my house. I should imagine they have been here a while but it was nice to hear. I hope to see one again some day soon. my bird on Thanksgiving morning was a reported Ash Throated Flycatcher at the Jones Beach Coast Guard Dunes..A treat for New York and east coast birders, However the Painted Bunting in our neighbor state to the north does make me a little jealous because that is one of my all time favorite birds to see any time of year. Made my first trip to Jamaica Bay and was blown away by the number, and the variety of ducks. It was wonderful to sit behind one of the ‘blinds’ and see a dozen Wood Ducks and one Hooded Merganser male floating just twenty feet away, undisturbed by my usual galumphing ways. Another high light of the trip was the chance to see the white rump of a Northern Harrier. I spent much of Black Friday at the National Zoo in Washington DC where I saw many lovely and rare birds including a kiwi, Kori Bustards, an Eclectus Parrot that perched a few feet from my face, and a flamingo feeding a mostly grown chick. For my favorite wild bird of the weekend I’d have to go with the adult Red-shouldered Hawk that flew across the road in front of the car and perched in a tree. Two Hummingbirds In New York – In November! Where Are You Birding This Final Weekend of October 2010?